To give you inspiration for your golf trip in Scotland we have put together some example golf tour packages. Combine links golf at famous coastal settings with scenic inland golf, or mix championship courses with hidden gems - there is so much from which you can choose! We arrange golf tours right across Scotland, from the highland courses of Dornoch and Castle Stuart to the west coast links of Troon and Prestwick. So you are sure to find a mix of courses for a golf tour that is just right for you. 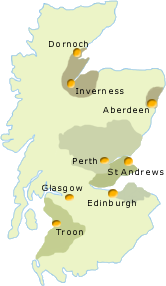 To see more of Scotland during your stay, choose a golf tour taking in more than one location. A true Scottish links golf tour taking in championship courses from Troon to St Andrews. A five star luxury golf tour starting in the heart of Scotland at Gleneagles and finishing on the East Lothian coast near North Berwick. Visit some of the gems of links golf on the east of Scotland, from North Berwick to Kingsbarns, near St Andrews. Play golf courses that are famous the world over, from St Andrews to Royal Dornoch, to Open Championship venues on the west coast. Or if you have less time, keep travel to a minimum with a short break golfing package, based in one location. Take a look at our current Special Offers & Featured Packages. Browse our choice of golf courses, or select a region of Scotland from the map on the right, and then tell us where you would like to play through our custom booking form. Create the golfing trip of a lifetime! We will be delighted to advise you and provide a personal quotation for your chosen golf tour. All our golf tours can be customised to your requirements. Not everyone wants the same length of trip, the same accommodation, or to play the same courses. We will create a golf tour package that allows you to play as much golf as you wish, or perhaps alternate golf with time for sightseeing. What's included in our golf packages Golf Courses Come and enjoy the great golf Scotland has to offer!